Lama Zopa Rinpoche has been discharged from the hospital and is now resting comfortably in a private home nearby the hospital. Rinpoche is now an outpatient at the hospital and will be going to the hospital 3 times a week for physio. At Rinpoche’s request we have researched Doctors of Chinese medicine. From many names Rinpoche chose one and on consultation with the doctor will start treatment very soon. Both the western and Chinese treatment will be compatible, no conflict . At “home” Rinpoche is very comfortable and relaxed and I think feeling much more at ease. Khadro la will be arriving soon and will be helping Rinpoche over the next few weeks. Again many thanks for all the support and prayers by so many. Ven.Roger Kunsang’s blog regarding the last 18 days. Rinpoche is doing well in the physio morning and afternoon. Rinpoche’s sugar levels are improving he is now on insulin. Blood pressure is now close to normal. Rinpoche still gets fatigued quickly which doctors say is normal in this kind of situation, so a lot of rest is required. Rinpoche wants to leave the hospital soon (would then become an outpatient). That may happen next week if all goes well. Again many many thanks for everyones prayers and support. Yesterday went well with Rinpoche , the physio’s were happy with Rinpoches progress in the pool and the gym. Quite a bit of joking and laughing going on. Rinpoche is always keen to get into the pool by himself but hasn’t been allowed, always the physio says no … You have to be lowered into the pool by hoist. This morning the main physio says Rinpoche can try get out of the pool himself ! Rinpoche is really keen to try… We are half way through the hydro therapy … Rinpoche enjoys the pool. 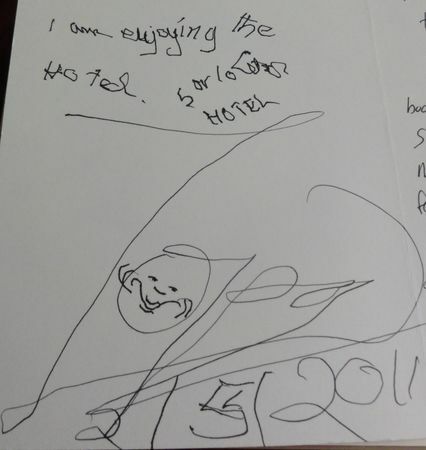 I am enjoying the hotel…..
Last night Rinpoche spoke for a little while and his speech had definitely improved. Then this morning he went for 1 hour in the pool for hydro therapy, in the afternoon physio again in the gym for 1 hour … the physio’s say he has improved quite a bit. Now you can see quite a difference so it seems there was a real need for rest! Rinpoche also spoke a little of the prayers he has been doing while in hospital … for the other patients around him, for all the future patients that will come to the hospital, for the patients that will use the room he is using in the future, for the patients who will use the bed sheets he has been using, the pillow slips etc … extensive prayers! A few days back Rinpoche had what the doctors said appeared to be a continuation of the stroke … this sometimes happens with stroke patients … in fact for the 1 month after having a stroke there is a 50% chance of another stroke. This is one of the key reasons for being in the hospital … to gain control over the blood sugar levels and blood pressure which are seen to be the conditions for a stroke if they are not at this time strictly controlled. Also to have the close monitoring which is necessary at these times. The doctor (who is a stroke specialist, looking after Rinpoche) says that usually patients are kept in the hospital for 4 to 6 weeks after a stroke. Rinpoche is continuing with his physio therapy in the pool and gym, but this has been interrupted due to Rinpoche being very tired/exhausted … another thing the doctor says happens a lot with stroke patients. Rinpoche will start hydro therapy again tomorrow, as well as physio in the gym tomorrow afternoon if the doctor feels he has rested enough. If all goes well and the therapy can continue then Rinpoche could be able to move around a little by himself in 1 or 2 weeks. Then Rinpoche can leave the hospital and become an outpatient (continue the therapy at the hospital under the same doctors and physio therapists while staying at home). Rinpoche also wants to try Chinese medicine, acupuncture etc. when his situation is more stable. It has been quite overwhelming the number of people from around the world offering well wishes, the pujas and prayers done by Monasteries, Centers and students, the offers of all sorts of help by so many. THANK YOU TO EVERYONE … A HUGE THANK YOU … please do continue. The night of the 3rd wasn’t an easy one for Rinpoche so in the morning in consultation with the doctor we cancelled the physio therapy sessions for the pool in the morning and the session with the physio in the afternoon. The doctor did some tests and thought Rinpoche had exhausted himself the day before in the physio sessions (it certainly was a full day … and partly maybe Rinpoche being very enthusiastic). Rinpoche rested all day and thru the evening, being very quiet and doing prayers. This morning (the 5th) the doctor cancelled the morning session in the pool and said the physio therapist would reevaluate Rinpoche this afternoon. Rinpoche this morning seemed much more rested. The hospital is small well laid out and in a nice setting … quiet. 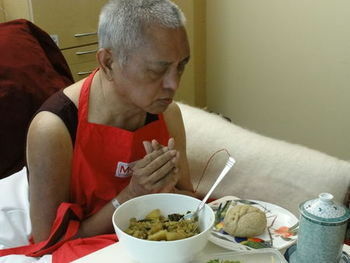 We plan this afternoon to take Rinpoche outside in a wheelchair for some fresh air and have some tea. In the evenings Rinpoche watches a little of the world and local news. The doctor just came and had a relaxed chat with us about Rinpoche’s condition … and thinks best for Rinpoche to take an extra week in the hospital to allow more time for Rinpoche to be walking with some independence. The weekend has been quiet, tomorrow morning Rinpoche will have his first therapy session in the whirl pool. Doctors say Rinpoche’s progress is very good with his right leg. The right arm has still little movement … they say the arm is always slower than the leg. The main concern for the doctors is the control of the blood pressure and sugar levels. This they say must be under strict control … otherwise the danger of another stroke. Rinpoche is committed to staying in the rehabilitation ward of the hospital for several more days and the doctors are very happy with this. This private hospital is working quite well for Rinpoche. The staff … nurses and doctors are very good and always willing to take time to discuss Rinpoche’s situation and future, it is the same with the nurses. Rinpoche’s food is cooked at the monastery and gets delivered 3 times a day … as well we take the hospital food which is quite ok and integrate it. Rinpoche can stand on his own for short period of time… but you have to be there in case he loses his balance … tonight he stood alone in one spot for several minutes and did a short walk (assisted) … which was pretty good … but then had to lay down and rest … fatigue happens quickly. Its Monday morning and Rinpoche just finished his first time in the pool for hydro therapy, Rinpoche said it was “pleasant”. It looked like Rinpoche enjoyed it … went on for about 40 mins. Lama Zopa Rinpoche in hospital, with great difficulty putting hands in mudra of prostration during extensive offering practice. Ongoing list of pujas and practices dedicated to Lama Zopa Rinpoche’s health and long life. Please click here. Extensive animal liberations and to count the numbers and to offer them to Rinpoche and request Rinpoche to live long. This is just a few of the pujas and practices. Please click here for ongoing updated list.